Department of Public Safety, Division of Fire & Emergency Services (DFES) entered into a Memorandum of Understanding (MOU), the terms of which include coordination on matters of interest such as safety preparedness and response, health and environmental protection, information sharing and capacity building. 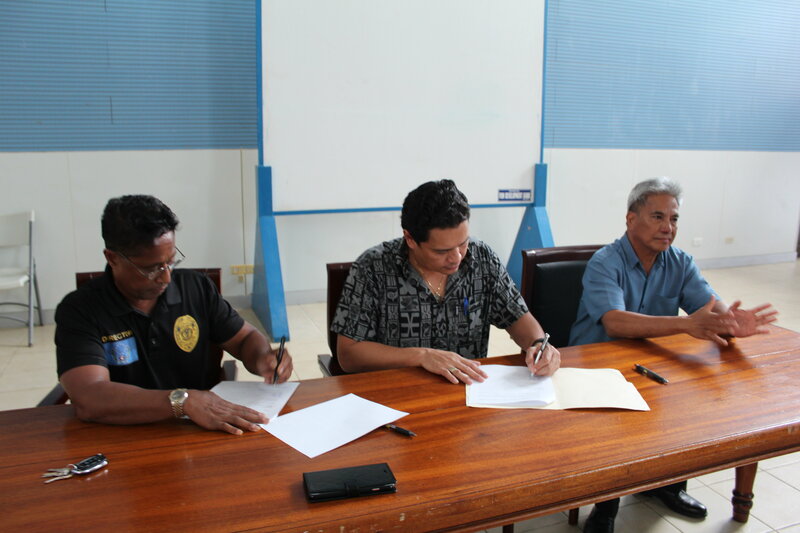 The MOU was signed into effect by the Honorable Governor of Pohnpei State, Mr. Marcelo Peterson, FSMPC Chief Executive Officer Mr. Jared Morris, and Director of Public Safety Mr. Benito Cantero. During a brief signing ceremony, FSMPC presented a donation of ten, double jacket fire hoses and swivel nozzles to the DFES, equipment that the Division had identified as most critical for fire-fighting. Governor Peterson expressed his gratitude for the donation and for the new partnership of like-minded public servants. Vital-FSM Petrocorp launched its strategic plan called VT2025 in 2016. One of the four strategic results areas is strengthened, mutually beneficial partnerships with government, NGO’s and communities. “Our business exposes us to hazards such as flammable and combustible liquids, and our efforts and priorities remain with a focus on operational safety and asset integrity. This MOU is a small start to improving our preparedness and response capabilities in the event of an emergency,” said Mr. Morris. Witnessing the signing were personnel from both institutions, including DFES Assistant Director Mr. Patrick Carl, FSMPC Health & Safety Officer Mr. Juanito Hasugulmal and Competency Assurance Program Manager Mr. Garrison Irons.